New forest…… Highland cow? Yes we have them here too. Liptastic! I usually paint animal seen in and around the New Forest, ponies, horses, donkeys, hares, cattle. You would not expect to see those hairy highlands here in the south of England, wrong, we have them too, grazing amongst the other four legged friends. I have had some lovely photos of them, with their magnificent horns. My favourite is one stood quite deep in a pond ( v large pond) the picture quality was not great on that occasion, as I was out riding early one morning and to capture the moment I had only my old mobile phone, sadly it is not a great image to paint from. Here is a young highland, I have used watercolours and caran dache neocolour water soluble. He was lots of fun, and I needed a change from feeing BLUE….. Even if I do like my new colours, I needed a change, or everything would start looking the same! 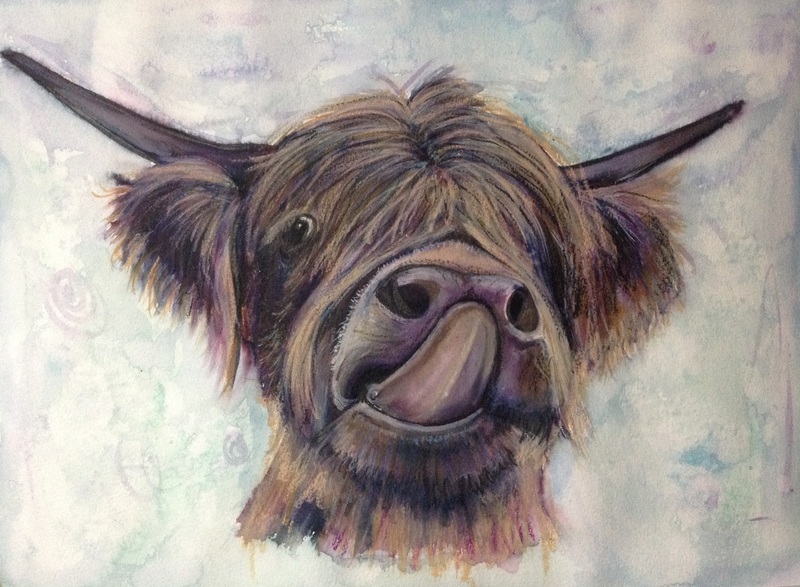 This entry was posted in art, caran dache neocolor, highland cow, new forest, watercolour and tagged art, caran dache neocolor, highland cow, new forest, painting, Painting, watercolour. Bookmark the permalink. 2 Responses to New forest…… Highland cow? Yes we have them here too. Liptastic! Oh nice, really captured the personality!